Life size, half of human brain. 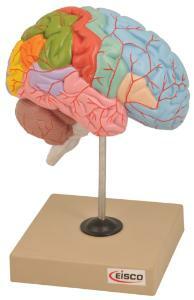 Students can study regions within the cerebral cortex are allied to certain functions. Impulses from the sensory organs, the skeletal muscles, skin and joints all travel to areas specialized in interpreting the information.